Dr. John Watson sat in the therapist’s chair and said nothing. His therapist was sitting across from him saying nothing. Both of them had been saying nothing for at least five minutes now. It had become a contest and John wondered if they’d sit like this for the full hour. It was fine by him. John didn’t want to care for anything again. He wasn’t certain he could care for anything again. John shifted his position. He spotted a stray hair on his jeans. A curly, black dog hair about 20 centimeters in length. He picked it off and dropped it. He watched the black hair fall to the floor. The therapist’s voice was starting to irritate John. Mycroft had been right. He should have fired her. He should never have come back after… after the Fall. But it seemed too much effort to find someone else, to have to go through everything again. Harry. Afghanistan. After…after Moriarty things had been insane. Correction. More insane. Mycroft wouldn’t let him help with Sher…the funeral. He said Sher—Sherlock had left very precise instructions. John was surprised how much this still hurt. Besides, John was virtually trapped in the apartment. Reporters and paparazzi swarmed around 221 Baker Street for weeks. Mrs. Hudson had had a tremendous row with Mrs. Turner when she’d found the neighbor chattering away about skulls and body parts and drugs busts and unsavory visitors and violin playing at all hours of the day and night. After the front page snap of Mrs. Hudson throwing a casserole at Mrs. Turner appeared followed the next day by her finding a pair of reporters from the Daily Mail going through her bins, she broke down and John sent her off to her sisters until things calmed down a bit. The police, burning from the daily accusations of incompetence in being duped by Sherlock, were looking for a scapegoat. They wanted to charge John as Sherlock’s accomplice for everything from fraud to theft to murder. John was called down almost daily to the station to answer questions about their cases, about what he knew. Mrs. Hudson had stood by loyally giving a thorough tongue lashing to the young police officer who’d come to interview her when he suggested that John and Sherlock had had an “unnatural” relationship. She’d ended up crying when the young woman said she had to be a “daft old biddy” to not get suspicious about two men who kept bloody body parts in their fridge. Hadn’t she ever heard of Jeffrey Dahmer in the States? He was gay, too. It was always “too.” It was taken as a fact that he and Sherlock had been partners in more than detection. “Girlfriends” always appeared in quotes. The papers were careful not to state anything that could be considered libelous, but the articles left no one in doubt about what the reporters meant, no matter what John said. Interviews with his ex-girlfriends didn’t help. Especially Jeannette who vented to anyone who would listen, particularly if they had a video camera. She’d appeared on so many crap telly shows, he’d heard she was being offered her own. She was probably thanking her lucky stars that she’d dated John Watson. Then the private lawsuits started landing. The other residents and business owners of Baker Street were contacted by an ambulance chaser who said that if there was no Moriarty, then Sherlock — and his partner —had to have been responsible for the explosion. After that hit the papers, there was an tsunami of suits. There were suits against John. There were suits against Sherlock’s estate. Even poor Mrs. Hudson had to fend off a few. John’s bank account was frozen while people determined what was exactly John’s and whether any of it was Sherlock’s and if so, whether any of it now belonged to someone else. He’d had to ask Harry for help, but he suspected from her too ready agreement and influx on cash that the money was really coming from Mycroft. By the time the first lawsuit landed, John was so depressed he didn’t even pretend to be angry when an attractive young women in an expensive suit and hair neatly pulled back arrived shortly afterwards, took the papers and told him to direct any others that arrived to her office. She left a card. The card was extremely tasteful and discreet. It wasn’t done by any quick printers but by engravers. The terribly tasteful, completely professional young woman suggested John also forward all business or other financial propositions to her offices. The first agent called before the police confiscated John’s mobile for evidence. By the time he got it back there were over eighty-six offers for book, movie, television and other deals for John’s exclusive story. Few cared if he was convicted of anything or not. Some made it clear that they hoped he’d get a conviction for something which would boost sales while preventing them from paying him anything. Most of these people had a pitch along the lines that surely he wanted to get his side of story out to the public. Apparently, none of these people had heard of John’s blog. The site went viral within five hours of the…Sherlock’s death. As news of Richard Brook’s death spread, which the sleazier tabloids and the conspiracy nuts insinuated was murder, the traffic grew exponentially. The comments were in the tens of thousands. The death threats didn’t bother John as much as the pathetic offers of marriage by women and men and the remarks made about Sherlock. The server the blog was on crashed on the second day. The hosting service delivered a bill in the five figures and implied that additional ones were coming for the amount of bandwidth being used. After Sherlock’s…suicide — John’d forced himself to start saying the word. Sherlock wasn’t just dead, Sherlock had committed suicide. This was biggest piece of the insanity. Sherlock dying by his own choice. Killed by Moriarty or one of his assassins, would have been bad, but John would have understood it. He understood it at that confrontation in the swimming pool when he thought they were both going to die in an explosion of C-4. Dying in battle John understood. What he couldn’t understand was Sherlock leaning forward — and stepping off that roof. In the maelstrom that had engulfed John following Sherlock’s suicide, John retreated once more into himself. He got up, shaved and showered, got dressed, showed up where he was told to show up — including court-ordered therapy — signed what he was told to sign by his solicitors, drank and ate enough of what was put in front of him to stop the talk of “detention for psychiatric evaluation,” and took care of whatever he was told he needed to be doing. John was trained to take orders, to take responsibility. He took care of things. When things began to calm down and there were fewer things to take care of, John started dressing less neatly. Then he started showering and shaving less. Then he just stopped bothering to get up unless he had to. His existence was pointless. He had no purpose. No one even needed him to replace a skull. Life was merely the ticking away of time. Each day was 86,400 seconds that had to pass until the next one. A good day held fewer seconds of pain then painless ones. That’s all there was. Pain and not pain. He felt nothing. And that was good. When John tried to remember what joy felt like, it seemed like a trick of memory, like a scene from a movie watched a long time ago that you vaguely recall you liked but can’t quite recall the plot details or who was in it. Joy was now defined as the absence of pain. When the efficient young women solicitor informed him that he needed an income to cover some of the expenses he’d accrued, John had looked at her and simply nodded, once. When Lestrade had called later that day and left a message on John’s new mobile number suggesting he apply for a police surgeon’s position that had opened, John did. Someone, Mycroft probably, was feeling guilty about what John had endured because to his surprise, he got the job. Now he spent his days trying to collect and piece together medical forensic evidence and trying to convince himself that Sherlock wouldn’t have sneered at his efforts. John was silent as the seconds ticked by. John discovered he was clutching the chair arms with white-knuckled fingers. He forced himself to relax his grip. John didn’t know if she meant the blog or the dog. Frankly, he didn’t care. It was raining when John left the tube. As he approached his apartment, he saw a commotion amongst all the umbrellas. Three young men were running towards him on the opposite sidewalk. Then John spotted the black shape they were chasing. The dog spotted him and switched direction, shooting into the street towards him. There was a screech of brakes and a soft thud. John stopped thinking and ran to where the dog had been flung by the impact with the cab. Someone came over to John and asked him to move the dog out of the street because he was blocking traffic. 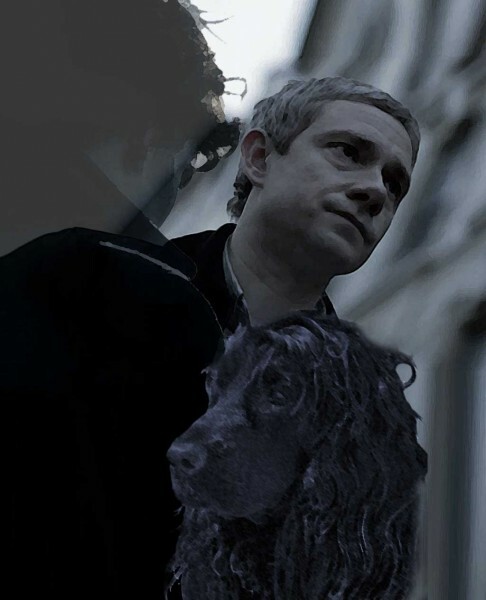 John lifted the dog into his arms and started walking, ignoring the rain, ignoring the people around him, ignoring everything around him until it grew very late and the dog’s body grew cold and stiff. Then John Watson stopped, looked around him and discovered he had no idea where he was or how he had gotten there. This entry was posted in FanFic, Post-RF-Reichenfeels and tagged bbc sherlock, FanFic, john watson, post-reichenbach, tv series on July 30, 2012 by JH Watson. Wow. That was perfectly John. Thank you! A book that is hard to finish when you’re on the last page? No thnkas :)My husband is a huge Sherlock Holmes fan, and I got him this from the library…he didn’t care for it at all, and did not want to read any of the other books in the series.